At a time when everyone’s fussing over farm-fresh food and eating healthily, perhaps we should rethink what organic means and get back to the root of the green eating message. When restaurants are charging upwards of $100 for a bowl of pasta dotted with organic tomatoes and two sprigs of basil, are we really changing our eating habits and educating the masses, or are we just creating a menu for those who want a light lunch after a session of yoga/Pilates/shopping? 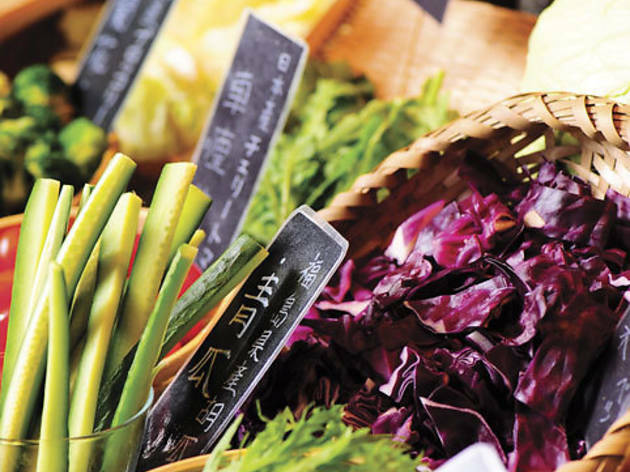 Out to reevaluate this organic fad is Farm Kitchen Vegi – a modern Japanese-Western restaurant housed in Tsim Sha Tsui East’s Cameron Plaza. 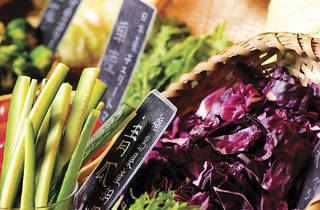 The focus here is on fresh, organic vegetables and fruits supplied mainly from farms in Japan. From the building lobby, which boasts a Zen-like rock water pool, an exclusive all-glass elevator (decorated with the restaurant’s menu and some faux vegetables) jets patrons up to the second floor restaurant. At the entrance, guests are greeted by a greenhouse cabinet of sprouts and a tall fridge stocked with farm-cultivated vegetables for retail orders. Inside, the brightly lit interior is decorated with light wooden chairs and tables that look straight out of a Muji catalogue. A long bar, which doubles as a semi-open kitchen, runs down one side of the restaurant, leading out into a narrow alfresco patio that looks out to the high-rise buildings clustered around the area. The restaurant operates on an all-you-can-order system for $258 per person. Half expecting a meal of meagre rabbit food, we were pleasantly surprised when we opened up the menu to find an extensive repertoire of interesting meat and veg dishes. Executive chef Terufumi Mihara comes from an Italian cooking background and preps all the menu items fresh to order with plenty of TLC and aesthetic finesse. But it isn’t just the food menu that impresses; the drinks list also holds its own little surprises. A short but carefully selected wine list offers various labels by the glass in the $50-$60 range. Being a Japanese-owned restaurant, Vegi also stocks a selection of sake, shochu and a delicious Zuisen umeshu Japanese plum wine ($35/glass). After placing our first round of orders (which, in our gluttonous excitement, totaled to pretty much the first three pages of the menu), we were directed to the salad bar out front. The selection was somewhat scant, relative to the menu offerings, but the all-seasonal greens were a fitting prelude to the oncoming stream of starters. These arrived at our table just as we were finishing up our red cabbage and spinach leaves with homemade mango dressing and plum salt. The standard of the dishes varied: some, like the deep-fried onion gratin soup and rice paper rolls with baby shrimp and vegetables, tasted bland and prosaic, while other items, including the creamy, broiled sliced salmon served with a lustrous hot spring egg dressing on asparagus proved way above the standard of your usual buffet fare. The crab meat and avocado tartar mixed with chopped eggs and horseradish mayo was another standout. Served in an avocado half, it had a rich, pulpy texture that was as satisfying as any meat item on the menu. The creative “mille-feuille” of thinly sliced avocado and supple bean curd sheets spiked with a garlic-soya sauce dressing also impressed, as did the deep-fried croquettes, which were plumped with a creamy mash-up of crabmeat and green soya beans so delicious it tempted us to order seconds. Our next round of orders was dedicated to carbs. First to the table was the penne with stewed apples and gorgonzola cream sauce. Though a little too runny, the blue cheese sauce tasted deliciously robust and mature, and paired beautifully with the concentrated sweetness of the softened apples. The penne was followed by a stellar roasted sea urchin and tomato risotto. Although the dish was topped with just three tiny discernable slivers of sea urchin, every last granule of the al dente rice was cooked and gelled in the rich, tangy and creamy uni-tomato sauce. It was a harmony of simple, satisfying flavours served warm in a shallow casserole. Despite having feasted on enough dishes to bring on a heavy food coma, we made sure not to leave without sampling some (i.e. all) of the restaurant’s homemade desserts. The pumpkin pudding with soya bean caramel sauce was the only bland-tasting disappointment. The raspberry tiramisu and banana chiffon cake – though airy on the first bite as most Asian cakes are – became increasingly addictive with every ensuing forkful. But it was the soft and sweet Japanese pear cheesecake and the crumbly seasonal fruit tart that captured our hearts with their subtle, autumn-themed flavours. Food at Farm Kitchen Vegi is, understandably, not in the league of most other five-star restaurants. But for an all-you-can-order joint, the options and execution are pretty, wait – really – up there. More importantly though, at this price range, Farm Kitchen Vegi is making natural, fresh food what it should be: accessible. If you really want to educate the masses about better, greener, healthier food, just cook it well and serve it. The people will learn. 2/F, The Cameron, 33 Cameron Rd, Tsim Sha Tsui, 2721 1800. Daily 11.30am-11pm. Buffet: $258 per person ($138/child).